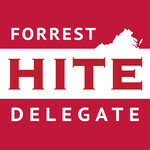 The 12th House of Delegates District is home to some of the most vibrant communities in Virginia, and we need leaders in Richmond who are committed to ensuring that we provide as many opportunities for the New River Valley as possible – that is why Forrest Hite is running to serve as YOUR Delegate. Forrest was born into a military family – going all across our great country before settling in Radford. He and his soon-to-be wife, Tatiana, continue to reside in Radford and plan on raising their family right here in the NRV. Forrest is a data resource administrator for a non-profit in Radford, and Tatiana is a Radford University law enforcement officer and continuing her education there. Forrest is a firm believer in our public school and higher education system. Living in Radford for almost a decade, his priorities to foster more opportunity here in the NRV include increased resources for education, smart economic development, low taxes, and commonsense values. With a robust K-12 education system, two of the Commonwealth’s best universities, and a growing tech industry, the 12th District can continue to be an economic powerhouse in Southwest Virginia and the entire state – we just need policies in Richmond to unleash those possibilities. Forrest is excited about meeting with voters in every corner of the 12th District, and would be honored to earn your vote on Tuesday, November 5th.